If you put someone or something first, you treat them or consider them as more important than anything else. For example, your family is the most important thing to you. You always put your family first. Your job is your life. You always put your job first. When I was born, I became the center of the universe for my father. He always put me first. Then my sister was born. He now put her first and me second. Some years later, we bought a puppy. As you can guess, he put that little puppy first and me and my sister distant second. 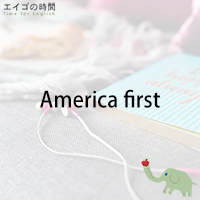 Two Fridays ago, when Donald Trump officially became the 45th President of the United States, he said in his inauguration speech, “it’s the right of all nations to put their own interests first”. He promised to put America first. I love my job. I put my job first.